Nguyen Huu Huan is a street full of cafes that I drive along almost every day. It's weird that I've never ever stopped in at any of these cafes to give them a try. But today my favorite cafe was way too busy and a friend recommended that I should taste the coffee at Cafe Hanh which is just a minute around the corner. As it was the weekend, they were busy as well but we landed a spot at the corner where two people had just left. On a bright and hot sunny day, we were lucky to be under the shade of a big old banyan tree. Cafe culture in Hanoi is way different compared to the south, not necessarily in terms of the quality or quantity, but just about the atmosphere; the people spreading along the footpath, chatting and enjoying their coffee, no matter how busy or dangerous the street is. 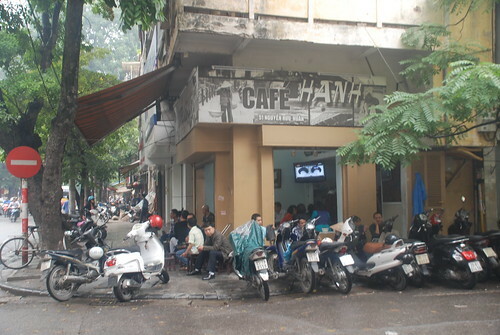 Having coffee in these kinds of locations is a great way to observe the happenings in the old quarter of Hanoi. I love looking at the different ways people serve and even drink coffee in the old quarter. No matter if you are rich, famous or poor, everyone sits at the same kind of low tables and chairs. Most cafes in the old quarter use plastic chairs and tables because its very easy to collect them up especially when the police are patroling. Businesses are not supposed to take up the footpath with their goods or chairs and tables so when the police come, it's quite amusing. The customers stand up with their coffees while the staff move these plastic chairs so they will not be confiscated. Of course, it's back to normal after 5 minutes when the police have disappeared. That's quite a normal part of Hanoi nowadays though I'm sure tourists get really confused if they experience it. But it's something that tourists shouldn't miss - sitting in the old quarter for half an hour, watching the craziness. Don't forget to say, khong duong (no sugar) or it duong (only a little sugar) because black coffee comes with the sugar already in it. 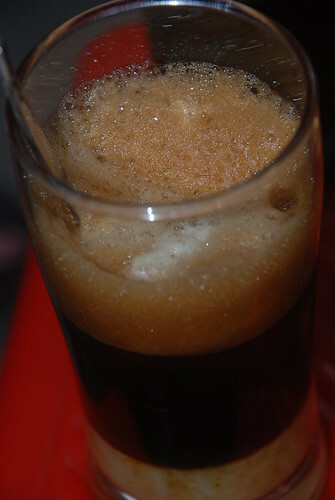 For white coffee, sweet condensed milk is always used. Yum! 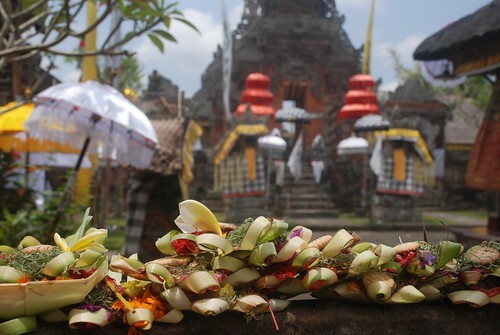 The offering ritual in Indonesia is a real highlight of a visit to Bali. 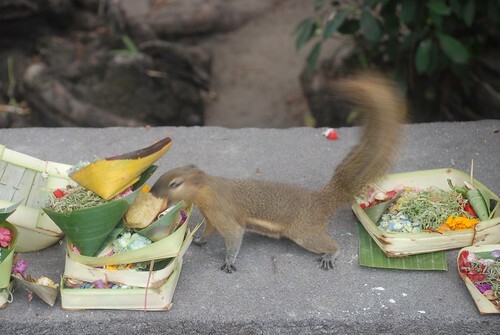 The Balinese perform their offering to the gods every morning. The tray of offerings contains various kinds of flowers, usually picked from the surrounding gardens, small spoons of rice on banana leaves, crackers, cigarette and, of course, incense. Each little tray is placed around the house, on the garden altars, on doorsteps and on the streets. They spend hours just preparing, perhaps as much time as for a meal. They look amazing. Offerings are also placed on motorbikes and inside cars. One interesting side effect of this daily ritual is that it provides food for the native wildlife. I have seen rats, birds and other animals, even squirrels, in town climbing up onto the altars to eat the offerings and wonder if this actually prevents them from going inside kitchens to rummage for food. Itbis definitely a special treat for these animals. 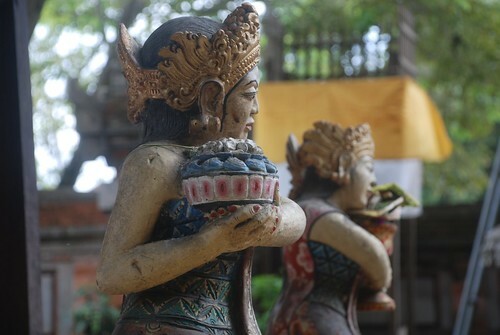 Observing this aspect of Balinese culture everyday was a very special experience. 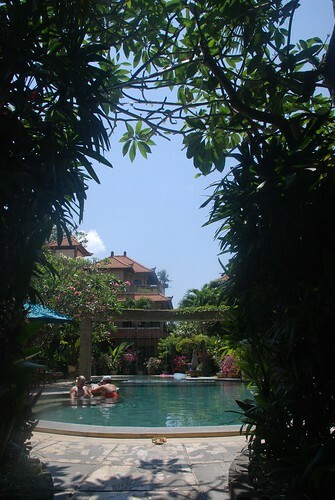 The main idea of going to Indonesia was to experience Ubud, where we spent two weeks staying at the Lala Lili Vilas in Penestanan. 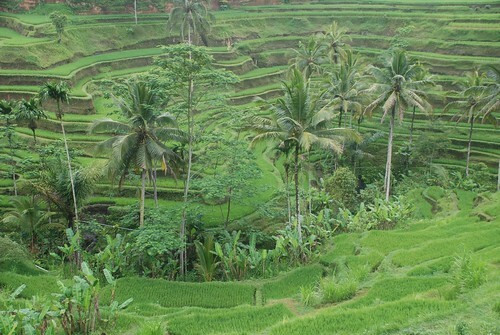 This little section of Ubud is located up 94 steps from the main road just after it crosses the river gorge. The two villas are behind a warung of the same name where we had breakfast any many other wonderful meals. Lala villa is like a treehouse, open-air with the sleeping areas contained in two lofts. The swimming pool surrounds a little sheltered island where we spent many hours reading and relaxing. The atmosphere was filled with the sounds of birds, frogs and geckos. The gardens are lush with tropical plants and flowers and insects. In short, a perfect place to spend a holiday. I discovered the neighborhood as much as possible by walking around, riding a bicycle and also driving a motorbike. 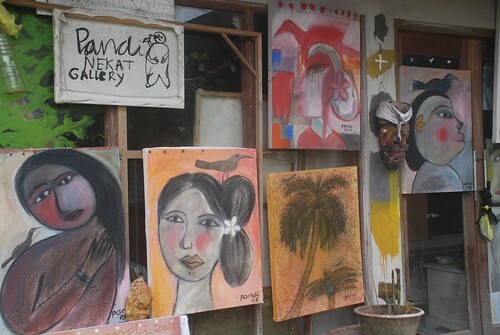 Compared to Hanoi, the people in Ubud are much calmer in the traffic, even though the main streets in the town have traffic jams several times a day. One morning, my friends and I woke up pretty early and went to the local market, which operates as a food market first before changing at about 9am into a market for tourists where all kinds of souvenirs can be bought. The sellers are generally pretty open to bargaining but can be a bit touchy if you go low on price. Our time in Ubud is nearly over but we intend to discover a bit more of the surrounding countryside over the next few days. I have arrived in Seminyak - Bali after a stopover at Singapore airport. It was actually a pleasant flight with acceptable food from Vietnam Airlines. The second sector of the flight with Singapore Airlines was real contrast and clearly Vietnam Airlines have a lot to learn. The level of service, the range of in-flight entertainment and the smiling faces of the crew are all lessons for my countries national airline. The last few days on the coast in Bali have reminded me of my hometown, Nha Trang as there are many restaurants along the beach. The only difference is that the beach is not as beautiful. The people in Bali are gradually becoming more friendly to me. I sometimes think Asians treat each other differently than the way they treat western tourists. I'm not sure why - probably someone could write a research paper on that topic! I'm not worried about that as this is my holiday and I am going to enjoy it as much as possible. We're staying at the Kusnardi Hotel where the hotel room is ok and the garden and pool are very beautiful. 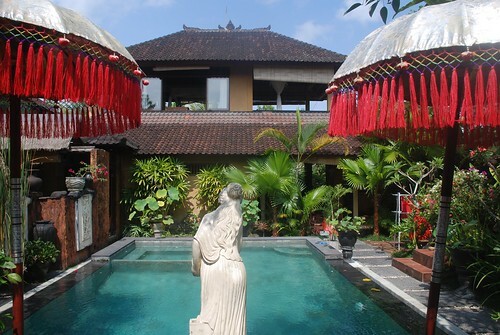 I have realized that most hotels on the coast and maybe in the whole of Bali have lovely design aspects with beautiful gardens and swimming pools. My other friends are staying at the Jayakarta, a very expensive hotel but they are very disappointed with the experience. We are lucky! 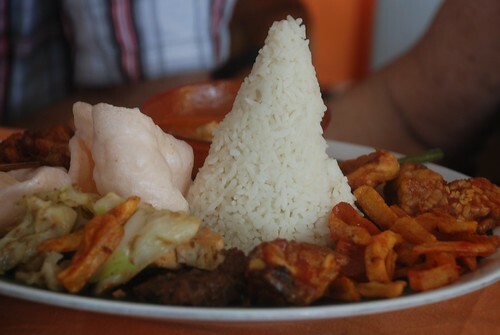 Indonesian food is great and we have tried many different dishes and most of them have been very tasty. 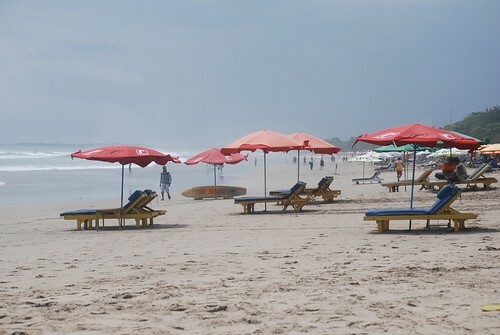 Some places serve very slowly (in Bali time) such as the Tekor cafe on the beach and Be Tunu cafe on the main shopping road. I would recommend Tunu due to the great food; huge serves at a very reasonable price. 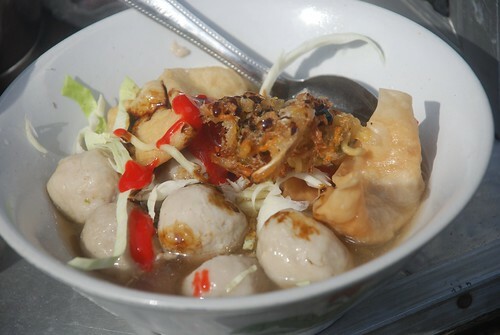 This afternoon during my walk along the beach I tried noodles from a seller on a motorbike. The noodle he served was very nice included noodle, tofu, dried shallot, few different balls, mint and celery on the top just only 10,000. 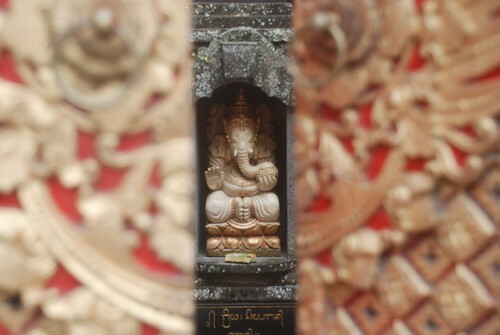 Just few thing for the first post about Kuta Bali, a very interesting small town 20 minutes away from the airport with mostly Australian tourists. I think this is the second Australia as more than 90% tourists are from Australia. Most sellers and restaurant staff speak English with Aussie accent and sellers here are everywhere and it seems to balance to Aussie tourists. Most restaurants here have Australian flat around the place and in the middle of the restaurant, but NO Indonesian flag. Weird!!!! !